Alice Miles put it well in The Times, today. “This week came the publication of the “Report to Ministers from the Department of Health Steering Group on the Statutory Regulation of Practitioners of Acupuncture, Herbal Medicine, Traditional Chinese Medicine and Other Traditional Medicine Systems Practised in the UK”. Otherwise known as twaddle.” . . .
“Regulate the practitioners – for safety, note, not for efficacy, as that is impossible to prove – and you give them official recognition. From recognition it is but a short hop to demand and then prescription: packet of Prozac, bit of yoga and a bag of dodgy herbs for you, sir.” . . .
Judging by Ben Bradshaw’s speech to the Prince’s Foundation, there may be a problem in conveying to him the evidence, but one can and must try. Why is it that a health joutnalist can do so much better than a university head? Yes, the chair of the steering group is Professor R. Michael Pittilo BSc PhD CBiol FIBiol FIBMS FRSH FLS FRSA, Principal and Vice-Chancellor of The Robert Gordon University, Aberdeen. Despite all those impressive-lookin initials after his name, I believe that this is a very bad report. Here is something about Prof Pittilo from his university’s web site (the emphasis is mine). 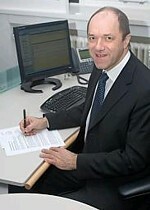 Professor Michael Pittilo joined The Robert Gordon University, Aberdeen, as Principal and Vice-Chancellor on 5th September, 2005. After postdoctoral research on arterial disease at the University of London, he was appointed to Kingston University where he became Head of Life Sciences. In 1995 he became Foundation Dean of the Faculty of Health and Social Care Sciences at Kingston University and St George’s Medical School (University of London). He was appointed Pro Vice Chancellor at the University of Hertfordshire in 2001. Notice that Prof Pittilo is a Trustee of the Prince’s Foundation for Integrated Health, source of some of the least reliable information about alternative medicine to be found anywhere. This steering group is, as so often, a nest of vested interests. It does not seem to have on it any regular medical or clinical scientist whatsoever. Why not? They just might produce some embarrassing facts perhaps? Like most government committees its members seem to have been chosen to produce the desired outcome. For a start, the university run by Prof Pittilo, Robert Gordon’s University, is itself involved in a few antiscientific courses. Since his report recommends that degrees in quackery should become mandatory, I expect he’d welcome the chance to run more. Amazingly, Robert Gordon’s University runs an Introduction to Homeopathy, just about the daftest of all the common sorts of magic medicine. Most of the the members of the steering group represent vested interests, though strangely this is not made clear in the list of members. An earlier report, in 2006, from the steering group was more open about this. Twelve of the members of the group represent Herbal Medicine, Chinese Medicine and Acupuncture (four from each). Most of the rest are lay members or bureaucrats. With membership like that it is, I suppose, not surprising that the assessment of evidence is, to put it kindly, grossly distorted and woefully inadequate. “… we recommend that three important questions should be addressed in the following order . .
(1) does the treatment offer therapeutic benefits greater than placebo? 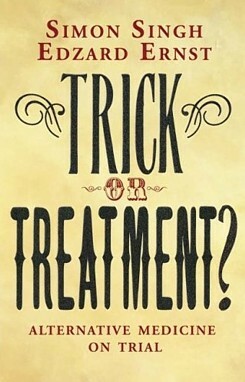 (2) is the treatment safe? (3) how does it compare, in medical outcome and cost-effectiveness, with other forms of treatment? The problem is that the assessment of the evidence for efficacy in the report is pathetically poor. The report, sad to say, consists essentially of 161 pages of special pleading by the alternative medicine industry, served up with the usual large dose of HR gobbledygook. There is really no excuse for this utterly incompetent assessment. There have been plenty of books this year alone that make excellent summaries of the evidence, mostly written for the lay public. They should, therefore, be understandable by any university vice-chancellor (president). The one benefit of the upsurge in public interest in magic medicine is that there are now quite a lot of good clinical trials, and when the trials are done properly, they mostly confirm what we thought before: in most cases the effects are no more than placebo. This is simply untrue, In recent years enormous efforts have been put into devising controls for assessment of acupuncture, but they are entirely ignored here. One thing that has been established quite clearly is that it makes no difference where you put the needles, so all the talk of Qi and meridians is obvious mumbo-jumbo. Have the authors of Annexe 1, and Professor Pittilo, not read the relevant studies? Two books this year have dealt with the question of evidence with great care. They are both by people who have been involved personally with acupuncture research, Prof Edzard Ernst and Dr Barker Bausell. Edzard Ernst is the UK’s first Professor of Complementary Medicine. 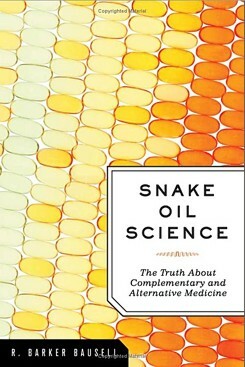 Barker Bausell was research director of an NIH-funded Complementary and Alternative Medicine Specialized Research Center at the University of Maryland. Singh and Ernst discuss thoroughly the question of controls and assess all the evidence carefully. Their conclusions include the following. The traditional principles of acupuncture are deeply flawed, as there is no evidence at all to demonstrate the existence of Ch’i [Qi] or meridians. By focussing on the increasing number of high-quality research papers, reliable conclusions from systematic reviews make it clear that acupuncture does not work for a whole range of conditions, except as a placebo. In short, the evidence is neither consistent nor convincing. It is borderline. Barker Bausell was himself involved in designing and analysing trialsof acupuncture. His conclusions are even less positive. These are serious authors with direct experience in CAM research, which is more than can be said of anyone on the steering group. Why are their conclusions ignored entirely? That is sheer incompetence. This is utter baloney. Anyone who advocates giving honours degrees in such nonsense deserves to be fired for bringing his university into disrepute (and, in the process, bringing all universities and science itself into disrepute). That includes also degrees that teach that “amethysts emit high yin energy“. If making peole do degrees in mumbo-jumbo is not the answer, what is? Clearly it would be far too draconian to try to ban quackery (and it would only increase its popularity anyway). The answer seems to me to be quite simple. All that needs to done is to enforce existing laws. It is already illegal to sell contaminated and poisonous goods to the public. It is already illegal to make fraudulent advertisemants and to sell goods that are not as described on the label. The only problem is that the agencies that enforce these rules are toothless and that there are a lot of loopholes and exceptions that work in favour of quackery. I have tried myself to complain about mislabelling of homeopathic pills to the Office of Fair Trading on the grounds that are labelled Arnica 30C but contain no Arnica. They solemnly bought a bottle and sent it to an analyst and of course they found no arnica, But nothing happened, because an exception to the usual law applies to homeopathic pills. The Advertising Standards Authority is good as far as it goes. They quickly told Boots Pharmacies to withdraw advertisements that claimed CoQ10 “increased vitality”. But they can exact no penalties and they can’t deal with lies that are told to you orally, or with anything at all on the web. Politicians seem to be immune to rational argument when it comes to quackery. But a few legal actions under these laws could bring the house of cards tumbling so fast that this gamma-minus report would become rapidly irrelevant. There will be no shortage of people to bring the actions. I can’t wait. “One can see how this might fit in with the Government’s “never mind the quality, feel the width” approach to university education. One can also see how established practitioners of such therapies might see this as a future source of income – how pleasant it might be to become Visiting Professor of Vibrational Medicine at the University of Westminster. Once again I have to ask, how is it that we have to rely on journalists to prevent vice-chancellors eroding academic standards; indeed eroding simple common sense? I guess it is just another sign of the delusional thinking engendered by the culture of managerialism that grips universities. to the Health Professions Council’ are 1) that an organisation must be in existence for five years and 2) that the ‘minimum size of a viable register will normally be 300 individuals, except where the traditions are extremely small’. How can a tradition be small? This seems to imply that anyone can set up a register of a few people and claim that their ‘therapists’ should be part of the Health Professions Council. Furthermore with private companies increasingly becoming involved in the NHS, there is huge scope for all this quackery to muscle in. If the public constulation ever appears on the DoH site (why is it not there today?) it is important to encourage plenty of input of common sense and science – I say this even though I am extremely skeptical of farcical public consultations. ‘Anyone can set themselves up in business as a complementary therapist. While people are not allowed to claim to cure disease, there are plenty of ways to imply it without breaking the law’. No need to comment except to ask whether this could constitute some sort of incitement to law-breaking. The problem with expecting CAM to provide evidence of efficacy is that the quotation above from Bausell, “there is no compelling, credible scientific evidence to suggest that any CAM therapy benefits any medical condition or reduces any medical symptom (pain or otherwise) better than a placebo”, is pretty much a definition of CAM. If there’s good evidence of efficacy it is no longer “complementary” or “alternative”. Good work, sir. I’ve argued for a while that “our” best bet is through trades descriptions type legislation, and I’m encouraged by the potential of the EU. Presumably such legislation would cover both homeopathic pills and CAM degrees (which, I imagine, cost a lot of money). or malformations.” This is a direct prohibition regardless of the context or result of the transaction. “misleading information generally” where it may lead to a different consumer decision (hello, homeopathic claims!) and where the information is related to one of many factors including “(a) the existence or nature of the product, (b) the main characteristics of the product” among many others. I am personally aware of a couple of stores that seem to break these regulations by claiming efficiency of homeopathic products not in the product labels (because this is prohibited!) but in small leaflets or brochures that accompany the products! I intent to take action when I verify everything. Any other advice would be very welcomed! Any ideas if/how this could be applied to the CAM Degrees? There is got to be something we can do for these degrees! Thanks for posting this David. I’ve emailed Ben Bradshaw with my thoughts. Well I think you should try a Flying Spaghetti Monster type approach, and along with a few like-minded individuals, set up a voluntary register of traditional european medicine practitioners, stressing the understanding of disease through the four humours, the dangers of black bile, the benefits of cupping, and the inutility of anaesthetics or sterile procedures before surgery. Then all you would need to do is get Robert Gordon University to set up a BSc in the “subject”. Although they wish to keep regulation separate from efficacy, that does not seem to me to be possible: it leads to absurdities. The official also said that BMJ article about EU rules on fraudulent claims was “very interesting and relevant”. I pointed out that the government would look pretty silly if dozens of their newly-created professionals immediately ended up in court for making unjustified claims. That looks to me like a good line to take when the ‘consultation’ starts. Of course the legislation should be used for any unfair practice, whether it comes from the pharmaceutical industry, herbalists or acupuncturists. I don’t know where those numbers came from, but it wouldn’t surprise me if they are more or less right. Eventually, no doubt, it will be possible to find the reasons for variablity in reponses, and to tailor treatments more precisely to individuals. That will take a lot of research effort and that effort most certainly won’t be made by herbalists and scupuncturists. In any case, 30 -50% is a lot better than the near-zero response to the sorts of treatments advocated by Anti-D.
A news article in the BMJ today quotes Prof Pittilo stating that “traditional health therapists [presumably the long tradition of quackery and snake oil sales is the tradition referred to here] were in huge demand, with 40% of the general public accessing one at some point”. He also considered that “…the fact that manipulation therapists currently had three regulators—one for osteopaths, one for chiropractors, and one for physiotherapists—was ‘nonsense.’” (BMJ 2008;336:1395 (21 June), doi:10.1136/bmj.a401 (published 18 June 2008). This is a bit rich. Three regulators is not the nonsense. It is the fact that two of these areas of quackery are “professionally regulated” at all that is the nonsense. Surely those legitimate areas coming under the remit of the Health Professionals Council (including physiotherapists, occupational therapists, radiographers, and speech therapists apparently) should be up in arms about being bracketed with practitioners of acupuncture, traditional Chinese medicine, and other alternative therapies. So – nothing about efficacy but an expectation of following best practice when it emerges. Surely if this proposal goes ahead the first principle for many of these newly regulated “healthcare professionals” should be to avail themselves of the currently available best evidence and cease practicing and get themselves a real job not reliant on the fears, superstitions, delusions and gullibility of others. When people are likely to be on holiday? email me and anyone else you can think might help. Here is a link to The Consumer Protection from Unfair Trading Regulations 2008. And another link to the announcement of the UK Unfair Commercial Practices Directive, from the Department for Business Enterprise and Regulatory Reform. I have to pay £144 every 2 years to the HPC or I can’t practice as a dietitian. Many of my standards of proficiency require evidence of efficacy and the use of up-to-date, good quality research in my practice. I have e-mailed the HPC asking if the same standards for efficacy will apply to the proposed new ‘health professions’ as to my profession. I will keep you informed. Interestingly I am required to “recognise the role of other professions in health and social care”, which presumably could mean I can’t tell patient that his/her registered Ayurvedic practitioner was talking rubbish when they said that “Ayurvedic treatment….can increase the digestive process and the elimination of waste & toxins from the body” (The Ayurvedic Clinic, Croydon) thereby promoting weight loss. Yes, JNB, I am up in arms. DC – I suppose herbs have a ‘near-zero’ effect – except to cause liver or kidney damage! Can you explain how we evolved in this environment where plants provide our food needs, but somehow cannot fulfill our medicinal needs? Most herbalists don’t want to be part of the poxy HPC. What next? Statutory regulation for restaurateurs? Sure, there seem to be two or three herbal things that have beneficial effects. That is why I said near zero. It does seem a little naive to suppose that plants evolved to provide medicines for humans. Try here. And I understand the authorities can close down restaurants if they find rats running round the kitchens. I think you’ll have to do better than that, Anti-D.
DC & Anti D: There’s an interesting paper on this in Animal Behaviour 2005, 70, 975–989: “The evolution of herbal medicine” by Benjamin Hart. Anyhow, this thread is about regulation. I think you’ll find that a majority of herbalists will be more than happy if you & the rest of your quackbusting cronies kick up a big stink about SR via the HPC (though they won’t agree with your reasoning). On this particular issue we’re right behind you – keep up the good work! Emery, E A. Ahmad, S. Koethe, J D. Skipper, A. Perlmutter, S. Paskin, D L.
Banana flakes control diarrhea in enterally fed patients. Nutrition in Clinical Practice. 12(2):72-5, 1997 Apr. Heo, H J. Choi, S J. Choi, S-G. Shin, D-H. Lee, J M. Lee, C Y. Effects of banana, orange, and apple on oxidative stress-induced neurotoxicity in PC12 cells. Journal of Food Science. 73(2):H28-32, 2008 Mar. Rabbani GH. Teka T. Saha SK. Zaman B. Majid N. Khatun M. Wahed MA. Fuchs GJ. Green banana and pectin improve small intestinal permeability and reduce fluid loss in Bangladeshi children with persistent diarrhea. Digestive Diseases & Sciences. 49(3):475-84, 2004 Mar. And some splendidly half-witted comments. I cannot see how Mike Cummings could possibly have supported reference to this report given his opinion about its lack of scientific merit. The dissenting voice was a damning one. That is very interesting and entirely plausible. It will be fascinating to see whether the evidence sent to the consultataion is eventually made public.